Have you ever wondered what it would be like if the world you lived in completely changed, turning your life upside down? And for those who have gone through an experience like this, can you remember how it felt to wake up in a world you were not used to? Even though life can throw many curve balls your way, the way you tackle them can redefine you as a person. I was just a toddler when I was diagnosed with a hearing impairment. My parents noticed my speaking skills lagged behind other toddlers of a similar age. I was diagnosed with a hearing loss at the age of 2 or 3. Even though it’s something I’ve lived with my entire life, it has been (and still is) a long and confusing journey for me as I try to figure out how best to live with it. You see, I’m not profoundly deaf. I can hear relatively well for now (I’ll get to that part in a minute), which means that I was brought up in a mainstream hearing environment. This didn’t come without its challenges though as I experience inaccessibility issues regularly. For example, noisy environments such as bars and restaurants, bad audio at conferences and mumbling voices when listening to podcasts. As a young child who didn’t know any better and acted naive about life, I just accepted it. But then as I got older and learned more about the world around me, well, that’s when things started to change. Because I am part of the hearing world but also have one “ear” in the non-hearing world, it has been a confusing position to be in. I already know what it’s “supposed to” be like if I had normal hearing. But that’s the thing, I don’t have normal hearing and I’m not profoundly deaf either. Well there was always the possibility that my hearing would get worse, which was something my audiologist told me as a teenager. I figured maybe that will give me a better idea of where I stand. But come on, as a teenager, I acted like a teenager – I was in denial about my situation and just wanted to fit in, like we all do as human beings. Nothing was going to stop me from playing football, playing the guitar, socialising with friends, going to restaurants (plenty of head nodding happens there) and going to the cinema (even if I had to pretend to enjoy the latter and act as if I could hear everything, which was awkward when everyone talks about it afterwards). Over time, I learned to develop tricks to help me get by, living in both worlds. For example, when playing the guitar, I’m not able to fine-tune my music without the help of technology or someone else who can assist me. Or when I go to the cinema, I only focus on action movies so I don’t REALLY have to talk about the story line, so I talk about the graphics, car chases and explosions instead. On top of that I was learning English, which is my second language (but now my main language), and I was having speech therapy sessions and attended countless audiology appointments. But you keep going, right? You don’t let anything stop you. I made it through two universities, a number of jobs and navigated life in general throughout my twenties relatively unscathed. Then one day, a few years ago, I realised my hearing had declined even further. Unexpectedly, I found myself in a much quieter world than the one I was used to. Remember that warning from the audiologist? Well things got very real, very fast. I realised there was no turning back. And so began a whole new unfamiliar journey over what to do next. It’s quite common to see online creators documenting their lives using whatever platform is available, such as social media and personal websites. The same applies for those who are going through certain struggles and share them with the world. And I used to find that strange. For something so personal, why would you share this with strangers? Many years ago, it’s not something that I would have thought of doing. And there was definitely no intention of writing about being partially deaf. Like I said, I was trying to fit in, so I told myself to keep going to the cinema and pretend that I enjoyed it. But there comes a time where you have to stop pretending and start being real, like I did by creating a video to publicly declare my intention to do so (and I’ll talk more about that later). I’m lucky to have a job that revolves around the internet. As someone who works in the digital marketing industry, it was natural for me to have my own website. I remember there were a lot of experimenting and trying to work out how to start one, as well as trying to figure out what it should be about. Having your own website sounds like a cool thing to have, but it wasn’t something I made a lot of use of in the early days. My priority was always on my clients’ or employers’ websites. But over the past few years, I’ve grown more and more involved with WordPress and have a deeper appreciation for those who use the platform to find their voice. It wasn’t until I started my own business in 2016 that I took WordPress more seriously, both for me personally and for my clients. That is when I started to get more involved with the WordPress community. Because of my continued desire to contribute to the community and also how much I enjoyed helping others to make the most out of their WordPress sites. This inevitably led me to being one of the co-organisers of the WordPress meet-up group in Edinburgh as well as the current lead organiser for WordCamp Edinburgh. My main WordPress site is my business site. It’s where I predominantly focus on the subjects of SEO, Google Analytics, WordPress (of course), online business, etc. You know, anything to help others use their WordPress site to grow their online visibility, engagement and conversion. There is another side to being part of WordPress, and that is the community – it means you’re involved with a wide variety of people, mixing with different personalities and opening your mind to more experiences. It is where you can share valuable insights that can impact not just your life but the lives of those around you who are using WordPress in some shape or form. And that includes the subjects of inclusivity and accessibility, two areas which have a direct effect on me. But with regards to accessibility, I do depend on subtitles/closed captions in certain situations. I’m thankful that TV is getting better at it, but outside the house, it’s not that simple. Having been to many meet-ups and WordCamps, the code of conduct is clear – it’s about making the environment welcoming and comfortable for everyone. The subject of online accessibility is becoming more important. Even though we are still behind in terms of understanding accessibility and making it a standard approach on websites, I’m starting to see people taking it more seriously, and rightly so. So I should feel comfortable about the online world, right? Well, not exactly. Accessibility is still trying to catch up online and offline for everyone, not just for deaf people. For example, there are still campaigns going on to have subtitled screenings at cinemas as they tend to be limited and are often used during impossible hours like Monday mornings. Because apparently, deaf people don’t have day jobs. The combined effect of a lack of accessibility and various challenges means there is a nagging feeling that being deaf means my abilities are limited in an online world. It’s a stupid thing, right? But imposter syndrome is a powerful thing. If you don’t have a firm hold on it, it can be beat the hell out of you. There came a point where I decided to let go of the very thing (my hearing impairment) that I felt was holding me back in life and to use that as the catalyst to move forward. I was reading a book called “Let Go” by Pat Flynn of Smart Passive Income. He is someone I’ve admired from afar and I have learnt a lot from him, even before reading that book. But that book was the first “soft” trigger for me in accepting the present and the future. Little did I realise how doing this would pave the way for a whole new world of possibilities and opportunities. And that’s when the second trigger happened. I had the opportunity of spending a day with Pat in San Diego – it was an experience I’ll never forget. But just as importantly and for the final trigger, it allowed me remove those chains that shackled me and gave me the freedom to move forward and to take advantage of whatever life had to offer me, even if it meant things were “limited” because of my gradual hearing loss. It’s amazing what can happen when you share your vulnerabilities and experiences with others. We can always learn from each other and sharing this experience has ended up helping many others. I have received private messages from strangers thanking me for creating videos that help spread awareness. And I’m not stopping there either. If I am going deeper into the deaf world, it doesn’t mean it’s going to be silent, at least not in an online sense. I have created a dedicated website called Hear Me Out! [CC] to document my hearing journey. It’s a place to share other people’s stories and to provide advice on managing in the deaf world – whether you are deaf or not. See, that’s the great thing about putting websites together. It’s about giving you the platform you never had before. It’s also the ethos of WordPress “to democratise publishing through Open Source, GPL Software”. It’s a funny thing when you start documenting and talking about your life online. Many people use social media as a platform to help with that and to create a voice, but I prefer to use my WordPress site for that voice. And then I use social media to help elevate it. Since I’ve been using WordPress and been involved in digital marketing for almost 10 years, it made sense to use that experience to my advantage. I’m lucky that my business allows me to use my expertise to help other people with their sites. But sometimes you have to be a little selfish and think about your own journey too, not just those of your clients or customers (as well as your friends and family). Not only are you allowed to do that, but you should do that. Because if you don’t help yourself first, you can’t help anyone else around you. Several years ago, I wouldn’t have thought of doing that. I mean, who the hell would want to listen to me? But I truly believe in the motto “your vibe attracts your tribe” – it doesn’t matter who you are, you’ve got something worth sharing online that your tribe, whoever they are, would love. That quote applies to me perfectly, but you can also apply it to your own circumstances if deafness doesn’t apply to you. It is kind of true in a way, but it has taken me a long time to realise it. Even though I wish I had started earlier, it’s about starting today rather than thinking about yesterday. And I think that can apply to any situation. I’m not just talking about creating a website. It’s also about finding the right time for you to let go of whatever is holding you back, and for you to understand what your next steps are. That was my challenge. I had to redefine myself if I wanted to move forward. I see no reason why you can’t do that too. So here is my message to you: if you have something that is holding you back, I urge you to write down what you are going to do about it. You need to stick it somewhere where you can see it all the time. And if you are feeling REALLY brave, you can let me know in the comment section below what is holding you back in your life – and what you are doing to let it go. My way of doing that was to create another WordPress site to share my stories and document my journey. Because take it from me, once you do that, the world awaits you… online and offline. 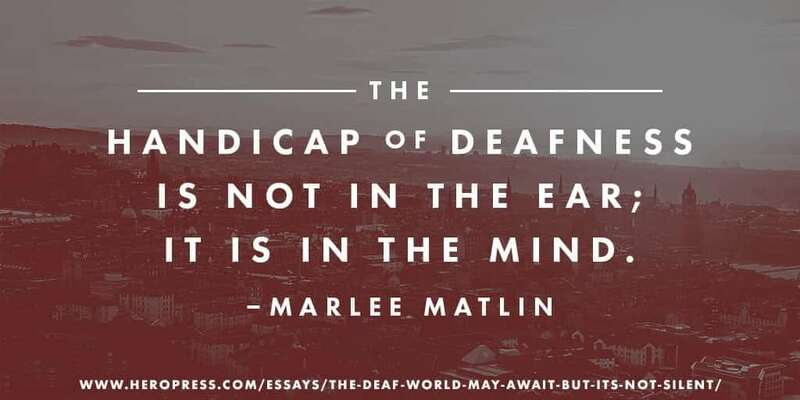 The post The Deaf World May Await, But It’s Not Silent appeared first on HeroPress.